No-Death Wish: A 100% Guide, Battle of the Birds. If the title and reputation of Death Wish wasn't obvious, you are going to die. A lot. Death Wish tracks your death count as well. Please keep in mind you'll need some practice before you start nailing these missions on the head, so you are going to die. A lot. Bonuses in Death Wish do not have to be completed at the same time. You can complete one bonus without the other being obtained, and you don't have to re-obtain them in order to earn the other. There is no penalty for using Peace and Tranquility, asides from the consumption of certain collectables. The item used seems to change from Death Wish to Deat Wish; Beat the Heat requires 7 Yarn, for example, while So You're Back from Outer Space requires 77 Pons. Most importantly: pace yourself. This is a game mode you have to play off and on. Excessive frustration only leads to further mistakes, and being in a panic for too long (looking at you, Mafia Rift Collapse) isn't great for your well-being. So listen to Peace and Tranquility, there's no judgement in taking a break to come back later. This isn't a game mode you finish all at once, so take your time. Something I've noticed is that it takes 4 hits to turn a faucet shut. Whack it 3 times, wait a quarter second, then smack it and run- you won't have to wait for it to finish and thus can bolt off hurriedly. Equip the Sprint Hat, without the Scooter badge equipped. Upon exiting the dialogue, turn right and use the tree to get to the construction zone. Dash-jump off of the edge and dive towards the faucet. Right before hitting the ground, un-dive. Jump to the faucet and bash it in. 1 down! Jump-dive repeatedly onto the rope flags until you get to the part where it turns into the wall. Use your jump to get high into the air and dive towards the edge of the waterfall ramp. Climb it. Hookshot to the faucet and turn it off. 2 down! Swing back to the waterfall ramp and sprint up on one of the edges. Climb the building at the end and bolt to the right, and cool down. 1 cool down left. Make your way across the lava river and bash the faucet. Halfway there! Use the flag rope to high jump towards the next set of flag rope. Beat up the faucet until it shuts off. 2 left! Hop atop the faucet turner and double jump + dive to get into the pool. Hop out of the pool at the edge and continue by climbing the box; remember, the heat timer only starts ticking when you leave. You can use the golden Mafia statue to leap to the above wooden platform, then onto the faucet. Either way, spin the faucet to take it out! 1 left. Use the wooden platform to leap to the balcony. Climb up, then sprint-jump into a dive to land on the rocks closest to the faucet. Leap to the faucet and shut it off. All done! Time for the hurrying bit. Make your way to the center of the lava river and use the Ice hat to fling to the center of the map. Don't panic! Immediately turn around and hop into the cannon. You'll cool down too. Finish! Know you're still heating up, so don't goof off too much before you grab the Hourglass. Snatcher's Hit List: Where Are You Darn It? Just a good thing to note: this mission does not auto-finish once you complete the main objective. You can defeat all the Mafia first and then complete the others if you so wish. Kill 5 Mafia without being punched: Just go to Mafia Town. This part is simple. Kill 10 Pushy Crows without getting bullied: Go to the Alpine Skyline's Birdhouse. Use the Time Stop Hat to navigate better, and never forget her homing attack. There should be enough to complete this bonus on the first go; if not, simply restart the level. Mafia: erm, you need to beat them to finish Snatcher's Hit List. Wait, you don't know? Go to Mafia Town. Crow: almost any level, really. They are the plain, round birds. Burning Crow: try the final boss level, they'll come up fast. Express Owls: the final boss level is your best bet as well. Pushy Crow: Alpine Skyline's Birdhouse level. Squids: The Artic Cruise's first level hides these behind the boat in the background. Rats: Down With the Mafia mission in Mafia Town, they are in the rafters where you can meet the cooking cat. Sleepy Raccoon: They can be found in many levels, but Mafia Town or the final boss level are good multi-tasking locations. Egg Bomb: Alpine Skyline's Birdhouse level. Lazy Cat Gang: Alpine Skyline in general or the final boss level are their main hideouts. Spiders: either go to the Subcon Well in the forest, or Alpine Skyline's Lavacake level. UFO: did you forget these enemies existed? I sure did. They can be most easily found on the "So You're Back from Outer Space" Death Wish, which comes after this Death Wish if you complete enough of the other Bonuses. If that's not something you'd like, then try the Penguin Gang's first Chapter. Use the Sprint Hat liberally! Abuse the Time Stop Hat if you're having trouble with swaying object timing (just know it does not slow the timer, which you can see in the bottom right corner). Make sure certain Mafia don't trip you up (in some cases, quite literally) and be sure you focus on only one of the bonuses at a time. If you fall at any point, just restart; you will not have time to make it in 65 seconds. You can make small slipups here and there (see video for proof) but more than 2 and you're best off restarting. Unlike some other Death Wishes, this one is just a straight gauntlet asking for gameplay mastery. As a result, there's not much else I can say; actions really speaks louder than words here. It took 37 more attempts but I managed to prove this Death Wish is completeable within 65 seconds, again! Re-recording hard Death Wishes like this is a pain. Snatcher Coins are easy by default, in my opinion. You can equip the updated Compass Badge and find them with ease. Regardless, this is a 100% guide and I will post their locations anyway. 1. Atop the bell tower. To reach it, climb the Outer Space parkour area (but during the day, if it isn't clear) and leap onto it. For perspective, there is a Rift Token at the end of the small section if you have not collected it already. 2. Near the end of the "Welcome to Mafia Town" level there is an unfinished tower atop the river, with the Shopkeeper standing atop it. If you go underneath where the river flows, you will find the Coin. 3. This can only be obtained by reaching the top of Mafia Town; thus, you must either beat "Heating Up Mafia Town" or start "Down with the Mafia." Climb one of the golden Mafia statues in the front, then jump to either sun shade curtain. Leap atop the small statue's perch, then jump atop the building; you'll find the Coin in the center. This challenge seems daunting at first, but in all actuality it's far easier than it appears. Equip the Magnet Badge, the Sprint Hat, and psyche yourself not to panic. With all that squared away, you've already given yourself a fighting chance. 1. Make a beeline for the hatch and leap in. 1. Turn to the left and climb the boxes. Run across the barrels near the Pon. 2. Leap atop the building and dive onto the Pon on the lamp. 3. Leap off and snag the Pon near the water. 4. Run around the building on the water path to the Pon atop the fish. 5. Sprint-jump and dive to skip a platform and snag the Pon. 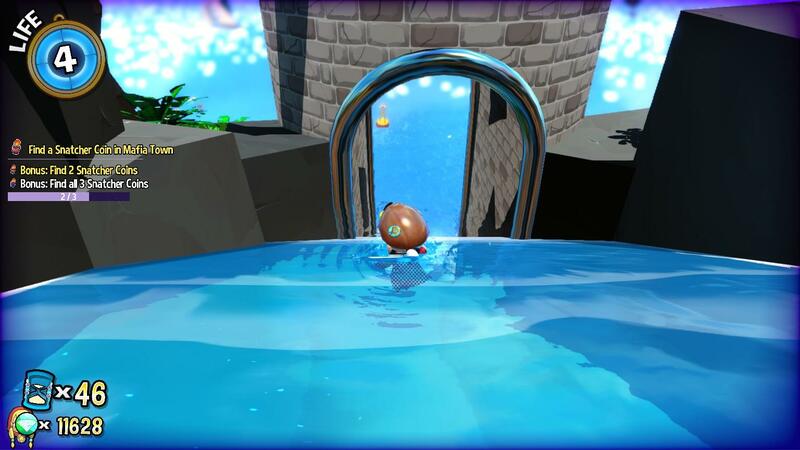 Fall immediately into the water (diving over the Pon to snag it and shooting past the platform seems to be fastest). 6. Use your quick respawn to leap into the hatch. 1. Kill the Mafia atop the fish. Press 3 to swap to the Brewing Hat if you're having trouble landing the homing attack hit. 2. Turn around and leap atop the meat roll, then run past the Pon on the side to collect it. 3. Leap OVER the obstacle. If you move directly over the Pon, it will be collected. 4. Sprint-jump and dive to hit the ground, then sprint to the Pon in the corner. 5. Sprint back to the building and sprint-jump to climb the building. Get atop it and beat up the Mafia, remembering to double-jump and homing attack to insta-collect the Pon. 6. Leap to the Pon atop the lamppost, then jump into the hatch. 1. Hurry into the hatch! The camera seems to have a tendency to skew slightly to the right when you gain control, be careful. 1. Turn to the right and snag the Pon all on its own. 2. Turn left and use the spring to leap up and collect the Pon atop the flag rope. Make sure you land on the tree for efficiency's sake. 3. Leap to the Pon all on its lonesome, make sure you hit the ground softly as to avoid tripping. 4. Use the spring in the corner to leap atop the tree. Make sure you jump mostly vertically and use double jump to move horizontally at the apex, else you will bop your head on the leaves. 5. Sprint-jump into the flag rope and use the high jump to make your way to the Pon below the ledge. Climb the wall. 6. Leap onto the stairs and then leap over them again to get behind the building to grab the Pon. 7. Sprint to the stairs and leap at a decent height to use wall climb to finish scaling. Try to avoid getting stuck at the top of the stair wall! Leap into the hatch as before. 1. The final stretch! Immediately jump atop the umbrella to snag the Pon. 2. Immediately DIVE to get to the ground as quickly as possible, and grab the Pon at the building edge. 3. Hop atop the triangle roof and stop sprinting so you can use double jump to snag the dangling Pon without having to hang at the edge. 4. Slow down again to leap directly atop the Pon. The trampoline effect will kick in and you'll fly into the air. 5. Land on the ground and use a double jump to scale the golden Mafia statue for its Pon. 6. Leap over to the tree and collect its Pon. 7. Sprint as fast as you can to the hatch and leap in! 1. Bash the Time Piece and run after it, but make sure you don't get directly beneath it; this will make it sit on Hat Kid's head and make it unreachable. 2. Repeat the process until you break it open! Be sure to wait a brief moment to see where the Time Piece lands, else you'll look like an idiot when you dive, miss, and die trying to collect it. 1. Climb the boxes to your left and snag the Pon. 2. Leap over and climb the building, jumping to the Pon atop the post. 3. Fall down and grab the Pon near the water. 4. Grab the Pon atop the fish; obtaining this one is faster than grabbing some later ones. 5. Leap into the open hatch. 1. Turn left and use the meat roll to climb atop the building. Run past the Pon to collect it. 2. Use the balloon to leap above the obstacle and run across it to collect the Pon underneath. 3. Leap over to the Pon near the water and collect it. 4. Climb the building and use it to leap the the Pon atop the post. 5. Leap into the hatch! 1. Turn right and grab the lonely Pon. 2. Turn left and use the spring to leap up and grab the Pon. Be sure to land on the tree. 3. Grab the lonely Pon ahead. 4. 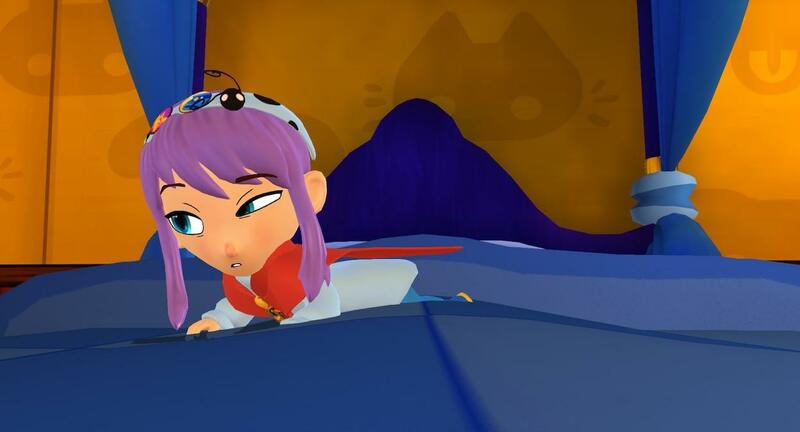 Climb the edge and double-jump & dive to both collect the Pon and climb the wall. 5. Leap onto the stairs then leap behind the building to grab the Pon. 6. Run back to the stairs and climb them to get into the hatch! 1. Use the umbrella to leap high into the air and grab the Pon. 2. Dive immediately to get the ground quickly and obtain the Pon on the building. 3. Leap onto the triangle roof and slow down to use double-jump to grab the Pon and return without grabbing the ledge. 4. Leap onto the Pon right above the trampoline sun cover and dive back onto the ground. 5. Hurry to the hatch and jump in! 1. Use the same strategy as in the all-Pon Run to destroy the Time Piece in time. Collect-A-Thon has now been proven doable, and even better, my progression was proven to be lacking in any kind of optimization. Here's some notes to help you, if you don't want to watch the video. Make sure you have the Magnet Badge equipped. That sounds like a given, but you're going to need this Badge desperately to have any chance. If you're good at the Scooter Badge, use it to speed up collection. Just don't goof up, else you're better off with the more controllable Sprint Hat. Pons do not despawn after being generated by Mafia, Vaults, or the old man. Make sure you don't have the Magnet Badge equipped, and go around doing chores until you're ready to begin the Collect-A-Thon in earnest. Don't forget about Peace and Tranquility. If you cannot find the execution even with the video's help, you can always activate it and say "this challenge isn't for me." Make a mental map and make sure you NEVER retrace your steps. Any Pon dead-zone is a dead-you-zone. The waterfall ramp and surrounding area has a metric buttload of Pons all bunched together, just make sure you're going down the ramp and AFTER you collect the nearby Pons! Think of going here last to top off. Equip the Scooter Badge, you won't regret it on this map. As the level starts, hurry to the river with the wooden bridge. Use the Ice Cap to bounce all the way to the top. Turn around and fling yourself into the mud puddle. Then, spook the Mafia goon. Be sure to spam through the dialogue to continue ASAP! Don't get too close to the Mafia goon! He'll knock you around. Just make sure you're near his stop nodes and scare him as soon as he arrives. 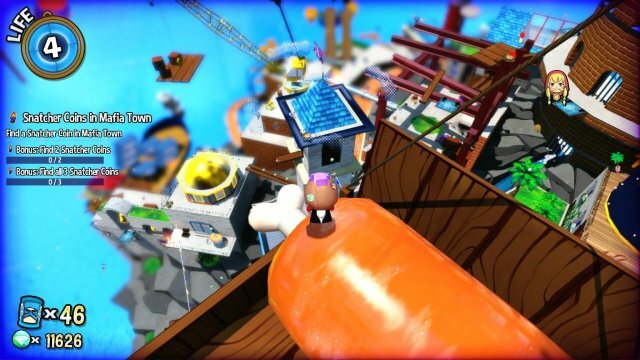 Navigate carefully in the platforming sections high above, a fall means the end of your Death Wish attempt. Mafia's Jumps: A Platforming Game? You can reach the Mafia goon without jumping once. Do not touch water, or flag rope. If you do, you've forced yourself into jumping. For the 7-Jump Run, this ends early. Hanging onto edges and then pulling yourself up with Space counts as a jump. If you grap a ledge, just press Control to let go. Double-jumps count each leap, meaning it counts as two jumps total. As a result, the Sprint Hat as a distinct advantage in the later platforming section. Diving does not count as a jump. This doesn't sound like a big deal, but it's an incredibly important note at the very end. Make your way to the red cannon on the left side of the map. Simply follow the path on your left when you enter. Use the cannon to reach the other side of the map. Scale the rocks until you can use them to leap atop the umbrella without jumping conventionally. Use the umbrella to leap onto the wooden platform. From there, scale the wooden ladders. Use the Ice Cap to leap over the fence and onto the rooftop. If you can't make the hop fully, use the umbrella below to get the height you need. A perfectly timed Ice Cap hop will make you hit the balloon; use said balloon to reach the rooftop to the right. Dive from the rooftop to the rocky outcropping with the ladder attached. Scale the rocks and use the Ice Cap to hop onto the umbrella. Get dirty and give the Mafia goon a good scare! Equip the Sprint Hat and sprint-jump into dive to make it across. Jump 1 tallied. Use the Ice Cap to leap all the way up the pipes and to the platform. Don't forget you can kill the Sleepy Raccoon if he gets in your way with the umbrella. Sprint-jump into dive onto the Mafia's platform. Jump 2 of 7. Sprint-jump again into dive to climb the platform the last inches up. Jump 3 down. Use the Ice Cap's hop into a dive to get onto the banner. Scare googly-eyes, then go up to the edge of the banner. Line yourself up (this is crucial!!) before Ice Cap hopping into a dive. Be sure to time it such that you land ON the platform and not grab the edge, else your run is over. Sprint-jump into the wall and scale it, then hop off. That's jumps 4 and 5 back-to-back. Sprint-jump into dive on the distanced platforms. These should be easy hops if you've got your timing down! All jumps have been made, time for the victory lap. Get the Mafia to reveal his Time Piece, then use the Ice Cap to hop from the barrels to the boxes, and finally dive onto the Time Piece. Death Wish complete! Here's the video for this! By George, this one is hard to get until you see it in action. This is an interesting time challenge. You may think 30 seconds is way, way, way too short to obtain all 4 Codes, but there's a couple interesting addendums that will make your life a lot easier. For you see, every time you collect a Code, the timer resets back to 30 seconds, and the Time Stop Hat affects the clock this time! Additionally, like many other Death Wish Bonuses, the two for this Death Wish are strict opposites of one another; you will not find the time to kill 10 Mafia without the Time Stop Hat, and vice versa. So pick the Bonus you wish to go for and stick to it. Something also key to keep in mind: the timer ends once you open the Vault, so don't panic about having enough time. Follow the same steps as Finding the Time, but without beating up the Mafia. Before you collect the first Code, be sure to stand on the boat where its movement turns back around, and collect it there for more time. You do not have to complete this Death Wish to earn the Bonus, merely defeat 10 Mafia before time runs out. So if this run is too much to finish as well, know it's not exactly a tryhard effort. Just be sure to wear the Fast Hatter Badge and spam the Time Stop Hat at every possible opportunity! Face the same direction as the Vault is facing and jump off to the plaza below. Try to land on the Mafia on the right and beat him up. Beat up the two Mafia near the blue Vault (the one standing next to the vault is one hit!) and then dive through the open spot towards the Code near the docks. Beat up the sailor Mafia, then grab the Code. Timer reset, 1/4 down! 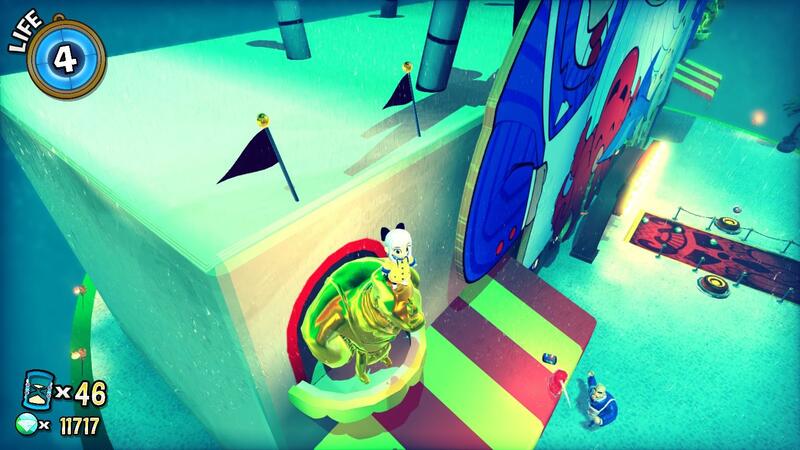 Hop across the boats and onto the rocks, then climb your way to the carnival area. Beat up both of the Mafia there. Leap onto the flag rope and climb the series of flag ropes up to the waterfall. Use the Time Stop Hat to find the proper timing to grab the Code. Given progression speed, it can be in a variety of places, so plan accordingly for your second Code! Leap back to the waterfall ramp and clammer up the side until you can reach the two Mafia goons beating up the old man. This should make for 10 Mafia defeated! You can end here if you've beaten this Death Wish before. Leap onto the flag rope and use jump into dive to save time. Swing across the flowing river and grab the next Code atop the tent. 3/4 nabbed! Hop onto the tree and then the rocks, scaling carefully. You can take your time here heading to the last Code, and try to avoid using your Time Stop Hat for the last part. Use the Ice Cap to bounce on the platform over the river, and feel free to take your time getting to the Vault from here. You'll have plenty of time making it to the Vault. Activate the Vault and snag the Time Piece! The Bonuses for this Death Wish rapidly jump between "oh I'm probably going to get that on my completion attempt" to "holey crap you unholy swine I'm not a masochist." Specifically, the first Bonus is never missing your attack cue; that is, you always hit him every time the Mafia Boss turns blue. The second, however, is completing the boss fight with the One-Hit Hero Badge equipped. No one is going to fault you for defaulting to Peace and Tranquility to get this Bonus. Heck, for this 100% guide, I downright recommend it; I'm doing the same myself. Sprint Hat generally outperforms the Time Stop Hat during the Mafia Boss's "Super Charge!" attack. However, normal leaps are enough to clear the waves, use your double jump for better timing. When the Mafia Boss pulls his best Link's Spin Attack impression, either time your double/sprint jump perfectly or use dive to get the air you need over the Mafia Boss. The timing is a lot more precise than the original boss, and you need to master this to get anywhere in the fight! His first swipe across the stage is pretty easy to time, but every time afterwards, he gets faster! The Time Stop Hat may be able to help when he gets too quick for your practiced timing. You can bounce off of the Mafia Boss's head during his Spin Attack. Please don't try it or plan for it, I've found it to be inconsistent. Diving is excellent for getting that extra little oomph when avoiding his Super Charge. Just make sure you dive in the right direction, and not into one of his bouncing orbs! Health Pons still spawn in this fight, but only one at a time and in rare occurences. The Mafia Boss's sandbag dump with a charging Mafia goon is most easily taken down by the Sprint Hat. Make sure you jump TOWARDS the charging Mafia goon for the easier dodge, and land in the right spot so the second set of sandbags doesn't rain on you. Sandbags will plummet constantly on your position throughout the fight, so position yourself such that they don't get in the way when you're jumping around. During his Super Charge, they seem to have random placements near your position instead, so pre-plan which direction you go with each wave. If you're too far away from the Mafia Boss when he turns blue, don't be afraid to use the Time Stop Hat to reach him in time. You can only cross roughly half the stage before he snaps out of it. The Mafia Boss tosses an electric orb every other wave, plan for that accordingly. It's easier to backstep when there isn't an orb in the way. When the Mafia Boss starting yelling and writhing in rage for the first time, he adds his new attack: toss and dive. He uses this attack 3 times in a row, and only on the third will he turn blue. Don't try to get a cheeky hit in until that third attack, else you'll look like a fool like I did. Peace and Tranquility is your friend, never forget that. Don't be afraid to use it, don't let your pride get the better of you. There's no punishment or detraction for using it. The Boss's Spin Attack always behaves the same. Always. The amount of swipes generally increases as his Enrage levels increase, but still varies. The only real change is the sandbags. The Boss achieves enrage level 1 after 2 hits ("You're no match for me! "), enrage level 2 after 5 hits (incoherent grumbling of anger), and enrage level 3 after 9 hits (further grumbles of rage). The Boss goes down after 16 total hits. Enrage level 1 adds his sandbag/Mafia wave that rains down a series of sandbags with Mafia charging from the sides. Enrage level 1 begins his endless torrent of raining sandbags during his Spin Attack and Super Charge attack. Enrage level 2 adds his weapon tossing into ground pound attack. Enrage level 2 improves his sandbag/Mafia wave by increasing charging Mafia from 1 to 3. Enrage level 3 adds his Mafia Ball signature attack. Enrage level 3 upgrades his Super Charge into Ultra Charge (which increases his projectile speed), followed by a leap across the stage into Mega Charge (turns projectiles red and further increases attack speed). Enrage level 3 increases sandbag drop frequency, but does not affect fall speed or the dangle before the drop. Enrage level 3 adds the sandbag drops to his weapon toss into ground pound attack.